TXA et Plasma: A faire simultanément ? Plasma coadministration improves resuscitation with tranexamic acid or prothrombin complex in a porcine hemorrhagic shock model. Ce travail est effectué sur un modèle de choc hémorragique porcin (35% de la masse circulante 8 groupes randomisés selon l'administration de TXA, de PFC ou de PCC). Il est de manière très significative en faveur d'une co-administration du TXE et de plasma. Ces résultats sont obtenus avec l'administration d'une quantité relativement importante de plasma ce qui en clinique humaine peut représenter une difficulté logistique d'approvisionnement et de transport tactique. Le choix des auteurs d'induire une fibrinolyse pharmacologie par administration d'altéplase peut peut être expliquer la netteté des résultats rapportés? Traumatic coagulopathy has now been well characterized and carries high rates of mortality owing to bleeding. A 'factor-based' resuscitation strategy using procoagulant drugs and factor concentrates in lieu of plasma is being used by some, but with little evidentiary support. We sought to evaluate and compare resuscitation strategies using combinations of tranexamic acid (TXA), prothrombin complex concentrate (PCC), and fresh frozen plasma (FFP). Sixty adult swine underwent 35% blood volume hemorrhage combined with a truncal ischemia-reperfusion injury to produce uniform shock and coagulopathy. Animals were randomized to control (n = 12), a single-agent group (TXA, n = 10; PCC, n = 8; or FFP, n = 6) or combination groups (TXA-FFP, n = 10; PCC-FFP, n = 8; TXA-PCC, n = 6). Resuscitation was continued to 6 hours. Key outcomes included hemodynamics, laboratory values, and rotational thromboelastometry. Results were compared between all groups, with additional comparisons between FFP and non-FFP groups. All 60 animals survived to 6 hours. Shock was seen in all animals, with hypotension (mean arterial pressure, 44 mm Hg), tachycardia (heart rate, 145), acidosis (pH 7.18; lactate, 11), anemia (hematocrit, 17), and coagulopathy (fibrinogen, 107). There were clear differences between groups for mean pH (p = 0.02), international normalized ratio (p < 0.01), clotting time (CT; p < 0.01), lactate (p = 0.01), creatinine (p < 0.01), and fibrinogen (p = 0.02). Fresh frozen plasma groups had significantly improved resuscitation and clotting parameters (Figures), with lower lactate at 6.5 versus 8.4 (p = 0.04), and increased fibrinogen at 126 versus 95 (p < 0.01). Rotational thromboelastometry also demonstrated shortened CT at 60 seconds in the FFP group vs 65 seconds in the non-FFP group (p = 0.04). When used to correct traumatic coagulopathy, combinations of FFP with TXA or PCC were superior in improving acidosis, coagulopathy, and CT than when these agents are given alone or in combination without plasma. Further validation of pure factor-based strategies is needed. Evaluation of XSTAT® and QuickClot® Combat Gauze® in a Swine Model of Lethal Junctional Hemorrhage in Coagulopathic Swine. Cox JM et Al. J Spec Oper Med. 2017 Fall;17(3):64-67. L'injection de petites éponges a fait naître beaucoup d'espoir. Malheureusement cette étude expérimentale ne montre pas d'intérêt en matière de survie. Alors autant continuer avec des choses plus classiques et pour lesquelles on dispose, à défaut d'une vrai validation, au moins de beaucoup plus de recul. On rappelle tout de même qu'un pansement compressif sur un packing de plaie avec des compresses normales est efficace. Hemorrhage is associated with most potentially survivable deaths on the battlefield. Effective and field-tested products are lacking to treat junctional and noncompressible injuries. XSTAT® is a newly developed, U.S. Food and Drug Administration-approved product designed to treat junctional hemorrhage. The Committee on Tactical Combat Casualty Care has recently approved the product for use as part of its treatment guidelines, but data are lacking to assess its efficacy in different wounding patterns and physiologic states. Dilutional coagulopathy was induced in 19 large (70-90kg), healthy, male swine by replacing 60% of each animal's estimated blood volume with room temperature Hextend ®. After dissection, isolation, and lidocaine incubation, uncontrolled hemorrhage was initiated by transection of both axillary artery and vein. Free bleeding was allowed to proceed for 30 seconds until intervention with either XSTAT or QuickClot® Combat Gauze® (CG) followed by standard backing. Primary outcomes were survival, hemostasis, and blood loss. XSTAT-treated animals achieved hemostasis in less time and remained hemostatic longer than those treated with CG. Less blood was lost during the first 10 minutes after injury in the XSTAT group than the CG group. However, no differences in survival were observed between XSTAT-treated and CG-treated groups. All animals died before the end of the observation period except one in the XSTAT-treated group. XSTAT performed better than CG in this model of junctional hemorrhage in coagulopathic animals. Continued testing and evaluation of XSTAT should be performed to optimize application and determine appropriate indications for use. Studer NM et Al. J Spec Oper Med. 2017 Summer;17(2):82-88. Hémorragie: De la glace sur le visage ? Une constatation qui ne devrait pas surprendre ceux qui s'intéressent à la médecine de plongée et au réflexe d'immersion (1, 2, 3, 4), dont le facteur principal de déclenchement est l'exposition de la face à de l'eau froide. Blood loss causes central hypovolemia and in severe instances, it can decrease blood pressure and lead to cardiovascular decompensation. Simple and quick interventions that can be used to prevent cardiovascular decompensation in pre-hospital settings could be a valuable tool for first responsders. Cooling the forehead and cheeks using an ice/water slurry mixture has been shown to increase blood pressure for over 15 minutes. Therefore, face cooling could be used to mitigate decreases in blood pressure during blood loss. We tested the hypothesis that face cooling during simulated blood loss will increase blood pressure. Methods Ten healthy participants (22 ± 2 years, 3 women) completed two randomized trials on separate days. Both trials began with 30 mmHg of lower body negative pressure (LBNP) to simulate blood loss for 6 minutes. Then, either a 2.5 L plastic bag of an ice/water slurry mixture (0 ± 0°C) (LBNP+FC) or a 2.5 L plastic bag of thermoneutral water (34 ± 1°C) (LBNP+SHAM) was placed on the forehead and eyes and 30 mmHg of LBNP was maintained for an additional 15 minutes. We continuously measured blood pressure (Penaz method), heart rate (ECG), stroke volume (Modelflow), cardiac output, total peripheral resistance, and forehead temperature throughout the protocol. Forehead temperature did not change from LBNP (34.2 ± 0.6°C) to LBNP+SHAM (33.9 ± 1.4°C, P > 0.999) and decreased from LBNP (34.4 ± 0.5°C) to LBNP+FC (11.0 ± 1.6°C, P < 0.001). Mean arterial pressure did not change from LBNP (82 ± 10 mmHg) to LBNP+SHAM (80 ± 8 mmHg, P = 0.978), but markedly increased during LBNP+FC. The peak increase from LBNP (77 ± 9 mmHg) was observed after 3 minutes of LBNP+FC (98 ± 15 mmHg, P < 0.001). Heart rate during LBNP (76 ± 14 bpm, P = 0.978) was not different from LBNP+SHAM (75 ± 13 bpm). Heart rate was lower throughout LBNP+FC beginning at 2 minutes of FC (60 ± 16 bpm) versus LBNP (80 ± 19 bpm, P < 0.001). Stroke volume did not change from LBNP (72 ± 15 mL) to LBNP+SHAM (67 ± 18 mL, P = 0.857). However, stroke volume increased from LBNP (78 ± 16 mL) to LBNP+FC, and peaked after 5 minutes of FC (97 ± 32 mL, P < 0.001). Cardiac output did not change from LBNP (5.4 ± 1.0 L/min) to LBNP+SHAM (4.9 ± 1.0 L/min, P > 0.415). Cardiac output slightly decreased from LBNP (6.2 ± 1.5 L/min) to 2 minutes of LBNP+FC (5.3 ± 1.6 L/min, P = 0.038). Total peripheral resistance did not change from LBNP (15.6 ± 3.7 mmHg/L/min) to LBNP+SHAM (17.3 ± 3.2 mmHg/L/min, P = 0.613). Total peripheral resistance throughout LBNP+FC was greater than LBNP. The peak increase in total peripheral resistance was observed after 2 minutes of LBNP+FC (20.0 ± 6.2 mmHg/L/min) versus LBNP (13.2 ± 3.9 mmHg/L/min, P < 0.001). Le principe d'occlusion artérielle n'est pas nouveau. L'occlusion endovasculaire de l'aorte trouve sa place dans la gestion des hémorragies abdominales incontrôlable. Son intérêt en traumatologie ballistique de guerre est probable (1). Cette technique a été récemment décrite en phase préhospitalière (2). Nos conditions d'exercice méritent que l'on s'intéresse à cette technique (3). Haemorrhagic shock is a major cause of death in the acute care setting. Since 2009, our emergency department has used intra-aortic balloon occlusion (IABO) catheters for resuscitative endovascular balloon occlusion of the aorta (REBOA). Methods: REBOA procedures were performed by one or two trained acute care physicians in the emergency room (ER) and intensive care unit (ICU). IABO catheters were positioned using ultrasonography. Collected data included clinical characteristics, haemorrhagic severity, blood cultures, metabolic values, blood transfusions, REBOA-related complications and mortality. Results: Subjects comprised 25 patients (trauma, n = 16; non-trauma, n = 9) with a median age of 69 years and a median shock index of 1.4. REBOA was achieved in 22 patients, but failed in three elderly trauma patients. Systolic blood pressure significantly increased after REBOA (107 vs. 71 mmHg, p < 0.01). Five trauma patients (20 %) died in ER, and mortality rates within 24 h and 60 days were 20 % and 12 %, respectively. No REBOA-related complications were encountered. The total occlusion time of REBOA was significantly lesser in survivors than that in non-survivors (52 vs. 97 min, p < 0.01). Significantly positive correlations were found between total occlusion time of REBOA and shock index (Spearman’s r = 0.6) and lactate concentration (Spearman’s r = 0.7) in survivors. Conclusion: REBOA can be performed in ER and ICU with a high degree of technical success. Furthermore, correlations between occlusion time and initial high lactate levels and shock index may be important because prolonged occlusion is associated with a poorer outcome. La gamme quikclot s'agrandit avec toute une proposition de pansement adapté à l'usage hospitalier, que ce soit peropératoire ou en soins critiques. Individual clotting factor contributions to mortality following trauma. Kunitake RC et Al. J Trauma Acute Care Surg. 2017 Feb;82(2):302-308. doi: 10.1097/TA.0000000000001313. Un travail intéressant qui portant sur 1463 traumatisés d'ISS médian de 16 et qui met en avant l'existence de deux profils de coagulopathie traumatique (16% des patients pris en charge). Dans 49,30 des cas, un premier est en rapport avec des anomalies des facteurs II,VII,IX,X et protéine C . Le second profil (17% des patients) exprime des anomalies sur les facteurs V et VIII. Seuls seraient liés à une motralité à 28j. LA déplétion en facteur V serait associée à une mortalité à long terme. Ce travail milite pour une approche personnalisée de la ocaguklopathie traumatique. Acute traumatic coagulopathy affects 20% to 30% of trauma patients, but the extensive collinearity of the coagulation cascade complicates attempts to clarify global clotting factor dysfunction. This study aimed to characterize phenotypes of clotting factor dysfunction and their contributions to mortality after major trauma. This prospective cohort study examines all adult trauma patients of the highest activation level presenting to San Francisco General Hospital between February 2005 and February 2015. Factors II, V, VII, VIII, IX, and X and protein C activity on admission and mortality status at 28 days were assessed. Predictors of 28-day mortality in univariate analysis were included in multiple logistic regression controlling for traumatic brain injury (TBI), acidosis, age, and mechanism of injury. Principal component analysis was utilized to identify phenotypic coagulation. Complete coagulation factor data were available for 876 (61%) of 1,429 patients. In multiple logistic regression, factors V (odds ratio [OR], 0.86; 95% confidence interval [CI], 0.76-0.97), VIII (OR, 0.97; 95% CI, 0.95-0.99), and X (OR, 0.79; 95% CI, 0.68-0.92) and protein C (OR, 1.17; 95% CI, 1.05-1.30) significantly predicted 28-day mortality after controlling for age, base deficit, mechanism of injury, and TBI. Principal component analysis identified two significant principal components (Phenotypes 1 and 2) that accounted for 66.3% of the total variance. Phenotype 1 (factors II, VII, IX, and X and protein C abnormalities) explained 49.3% and was associated with increased injury, coagulopathy, TBI, and mortality. Phenotype 2 (factors V and VIII abnormalities) explained 17.0% and was associated with increased coagulopathy, blunt injury, and mortality. Only Phenotype 2 remained significantly associated with 28-day mortality in multiple logistic regression. Principal component analysis identified two distinct phenotypes within the entirety of global clotting factor abnormalities, and these findings substantiate the crucial association of factors V and VIII on mortality following trauma. This may be the first step toward identifying unique phenotypes after injury and personalizing hemostatic resuscitation. The purpose of this study was to investigate whether hemostatic dexamethasone-loaded nanoparticles (hDNP) functionalized with a peptide that binds with activated platelets could reduce cellular injury and improve functional outcomes in a model of blast trauma. Functionalized nanoparticles, or synthetic platelets, offer a wide variety of benefits and advantages compared to alternatives, such as increased biocompatibility and targeting of the injury site (DePalma, 2005). Blood loss is the primary cause of death at acute time points post injury in both civilian and battlefield traumas. Currently, there is a shortage in treatments for internal bleeding, especially for rapid administration in open field combat. In a recent U.K. study, less than fifty percent of soldiers diagnosed with primary blast lung injury (PBLI), the most common fatal blast injury, survived to reach a medical facility (Smith, 2011). This study examines potential therapeutic effects of hDNP on subacute recovery in brain pathology and behavior after blast polytrauma. An established polytrauma model that simulates severe injury, including PBLI and blast-induced neurotrauma (BINT), can be used to evaluate life-saving therapeutics (Hubbard, 2014). Poly(lactic-co-glycolic acid)-based nanoparticles with poly(ethylene glycol) arms and the arginine-glycine-aspartic acid (RGD) peptide to target activated platelets were fabricated. A blast-induced polytrauma rodent model was used to evaluate the functionalized nanoparticles at an acute stage. After anesthesia, Male Sprague Dawley rats were exposed to a single, representative “free field” blast wave from an Advanced Blast Simulator at Virginia Tech at a peak overpressure of 28 psi for 2.5 ms duration, operating above 50% lethality risk, in a sidethorax orientation (Hubbard, 2014). After injury, animals were immediately injected intravenously with hDNP, control dexamethasone-loaded nanoparticles (cDNP), or lactated ringers (LR) and physiological parameters were monitored. Sham animals were not injected or exposed to the blast wave. Open field assays were performed on surviving animals to measure levels of anxiety. At one week post-blast, brains were extracted and sections from the amygdala were obtained for immunofluorescent staining using glial fibrillary acidic protein (GFAP; activated astrocytes), cleaved caspase-3 (apoptosis), and SMI-71 (blood-brain barrier). According to physiological monitoring immediately after blast, oxygen saturation was significantly decreased in the control and LR groups compared to the active and sham groups. Using the open field test, elevated anxiety parameters were found in the control and LR groups compared to the hDNP group. GFAP was significantly elevated in the control group compared to the hDNP and sham groups in the amygdala. Caspase-3 was also significantly elevated in the control group compared to the hDNP group. SMI-71 was significantly reduced in the LR group compared to the sham group. hDNP treatment has the potential to assist recovery after internal hemorrhage. Immediate intervention to assuage hemorrhage, one source for injury pathology, is crucial to mitigate debilitating injury mechanisms that lead to cognitive and emotional deficits (Shetty, 2014). It is possible that through prevention of microhemorrhaging of the blood-brain barrier (BBB), hDNP was able to mitigate cellular injury and improve cognitive outcomes. Future studies will evaluate the effect on inflammatory and hypoxia-related proteins after hDNP administration post-trauma. La reconnaissance et la mise en place de la meilleure stratégie thérapeutique du choc hémorragique traumatique sont des enjeux fondamentaux qui se posent aux équipes de réanimation préhospitalières et hospitalières. L'application du concepts du damage control resuscitation (1) vise par la mise en place d'un stratégie raisonnée d'arrêt des hémorragies (2), d'un remplissage vasculaire mesuré (3) et d'une politique transfusionnelle spécifique (4). Parmi ces mesures, il apparaît important de garantir l'apport équilibré de plasma, de plaquettes et de CGR dans un ration élevé 1/1/1 ou 1/1/2. Deux études se sont attachées à ce point: L'étude PROMMTT et l'étude PROPPR ici présentée. La première confirme le bénéfice d'une telle stratégie avec une moindre mortalité chez les patients bénéficiant de rapport élevé supérieur mais uniquement dans les 6 premières heures. L'étude PROPPR semble confirmer ces données avec une moindre mortalité précoce par hémorragie mais ne réussit pas à confirmer l'intérêt d'un ratio 1/1/1 par rapport à un ratio 1/1/2 sur la mortalité à long terme. Severely injured patients experiencing hemorrhagic shock often require massive transfusion. Earlier transfusion with higher blood product ratios (plasma, platelets, and red blood cells), defined as damage control resuscitation, has been associated with improved outcomes; however, there have been no large multicenter clinical trials. To determine the effectiveness and safety of transfusing patients with severe trauma and major bleeding using plasma, platelets, and red blood cells in a 1:1:1 ratio compared with a 1:1:2 ratio. Pragmatic, phase 3, multisite, randomized clinical trial of 680 severely injured patients who arrived at 1 of 12 level I trauma centers in North America directly from the scene and were predicted to require massive transfusion between August 2012 and December 2013. Blood product ratios of 1:1:1 (338 patients) vs 1:1:2 (342 patients) during active resuscitation in addition to all local standard-of-care interventions (uncontrolled). Primary outcomes were 24-hour and 30-day all-cause mortality. 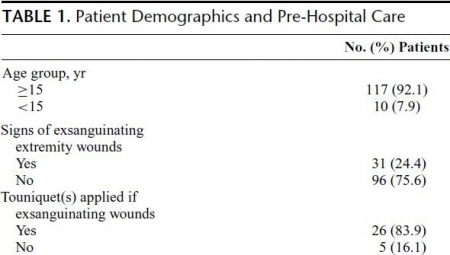 Prespecified ancillary outcomes included time to hemostasis, blood product volumes transfused, complications, incidence of surgical procedures, and functional status. No significant differences were detected in mortality at 24 hours (12.7% in 1:1:1 group vs 17.0% in 1:1:2 group; difference, -4.2% [95% CI, -9.6% to 1.1%]; P = .12) or at 30 days (22.4% vs 26.1%, respectively; difference, -3.7% [95% CI, -10.2% to 2.7%]; P = .26). Exsanguination, which was the predominant cause of death within the first 24 hours, was significantly decreased in the 1:1:1 group (9.2% vs 14.6% in 1:1:2 group; difference, -5.4% [95% CI, -10.4% to -0.5%]; P = .03). More patients in the 1:1:1 group achieved hemostasis than in the 1:1:2 group (86% vs 78%, respectively; P = .006). Despite the 1:1:1 group receiving more plasma (median of 7 U vs 5 U, P < .001) and platelets (12 U vs 6 U, P < .001) and similar amounts of red blood cells (9 U) over the first 24 hours, no differences between the 2 groups were found for the 23 prespecified complications, including acute respiratory distress syndrome, multiple organ failure, venous thromboembolism, sepsis, and transfusion-related complications. Among patients with severe trauma and major bleeding, early administration of plasma, platelets, and red blood cells in a 1:1:1 ratio compared with a 1:1:2 ratio did not result in significant differences in mortality at 24 hours or at 30 days. However, more patients in the 1:1:1 group achieved hemostasis and fewer experienced death due to exsanguination by 24 hours. Even though there was an increased use of plasma and platelets transfused in the 1:1:1 group, no other safety differences were identified between the 2 groups. Les données qui suivent sont extraites de la cohorte des patients inclus dans l'étude CRASH2. Cette réinterprétation des données a pour objectif d'analyser le lien entre la mortalité à 28 jours et la transfusion de CGR. Les auteurs retrouvent un effet délétère de la transfusion de CGR pour les patients les moins à risque de mortalité. Ceci est en faveur des démarches de stratégies transfusionnelles sinon restrictives du moins raisonnées en fonction du contexte notamment préhospitalier où cette pratique associée à l'apport de fractions coagulantes semble être d'un grand intérêt(1). Haemorrhage is a common cause of death in trauma patients. Although transfusions are extensively used in the care of bleeding trauma patients, there is uncertainty about the balance of risks and benefits and how this balance depends on the baseline risk of death. Our objective was to evaluate the association of red blood cell (RBC) transfusion with mortality according to the predicted risk of death. A secondary analysis of the CRASH-2 trial (which originally evaluated the effect of tranexamic acid on mortality in trauma patients) was conducted. The trial included 20,127 trauma patients with significant bleeding from 274 hospitals in 40 countries. We evaluated the association of RBC transfusion with mortality in four strata of predicted risk of death: ,6%, 6%–20%, 21%–50%, and .50%. For this analysis the exposure considered was RBC transfusion, and the main outcome was death from all causes at 28 days. A total of 10,227 patients (50.8%) received at least one transfusion. We found strong evidence that the association of transfusion with all-cause mortality varied according to the predicted risk of death (p-value for interaction ,0.0001). Transfusion was associated with an increase in all-cause mortality among patients with , 6% and 6%–20% predicted risk of death (odds ratio [OR] 5.40, 95% CI 4.08–7.13, p,0.0001, and OR 2.31, 95% CI 1.96–2.73, p,0.0001, respectively), but with a decrease in all-cause mortality in patients with .50% predicted risk of death (OR 0.59, 95% CI 0.47–0.74, p,0.0001). Transfusion was associated with an increase in fatal and non-fatal vascular events (OR 2.58, 95% CI 2.05–3.24, p,0.0001). The risk associated with RBC transfusion was significantly increased for all the predicted risk of death categories, but the relative increase was higher for those with the lowest (,6%) predicted risk of death (p-value for interaction ,0.0001). As this was an observational study, the results could have been affected by different types of confounding. In addition, we could not consider haemoglobin in our analysis. In sensitivity analyses, excluding patients who died early; conducting propensity score analysis adjusting by use of platelets, fresh frozen plasma, and cryoprecipitate; and adjusting for country produced results that were similar. The association of transfusion with all-cause mortality appears to vary according to the predicted risk of death. Transfusion may reduce mortality in patients at high risk of death but increase mortality in those at low risk. The effect of transfusion in low-risk patients should be further tested in a randomised trial. Amputé des jambes: Le bassin aussi ! Excepté l'extraction d'urgence de blessés sous le feu, la prise en charge den cas d'amputation traumatique doit inclure la forte probabilité de traumatisme du bassin. Une utilisation large des immobilisations pelviennes doit donc être à l'esprit. On rappelle simplement la gravité et la difficulté de prise en charge des hémorragies liées aux fractures de bassin. A frequently-seen injury pattern in current military experience is traumatic lower limb amputation as a result of improvised explosive devices (IEDs). 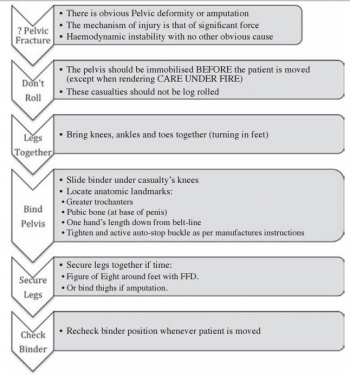 This injury can coexist with fractures involving the pelvic ring. This study aims to assess the frequency of concomitant pelvic fracture in IED-related lower limb amputation. 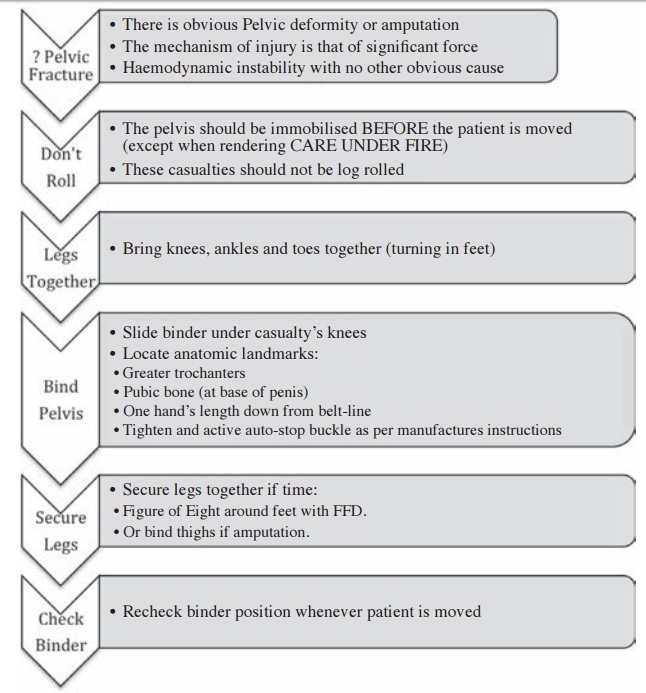 A retrospective analysis of the trauma charts, medical notes, and digital imaging was undertaken for all patients arriving at the Emergency Department at the UK military field hospital in Camp Bastion, Afghanistan, with a traumatic lower limb amputation in the six months between September 2009 and April 2010, in order to determine the incidence of associated pelvic ring fractures. 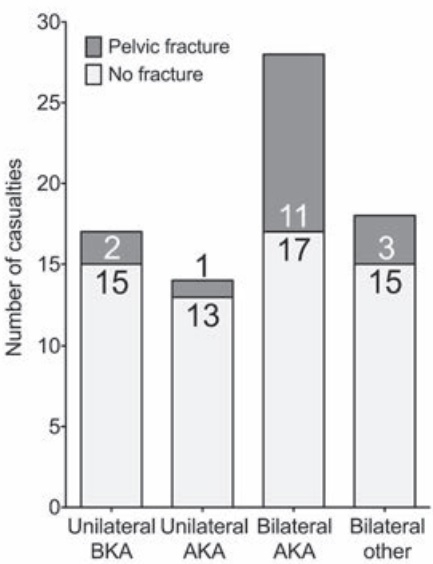 Of 77 consecutive patients with traumatic lower limb amputations, 17 (22%) had an associated pelvic fracture (eleven with displaced pelvic ring fractures, five undisplaced fractures and one acetabular fracture). Unilateral amputees (n = 31) had a 10% incidence of associated pelvic fracture, whilst 30 % of bilateral amputees (n = 46) had a concurrent pelvic fracture. However, in bilateral, trans-femoral amputations (n = 28) the incidence of pelvic fracture was 39%. Duan C. et Al. Int J Clin Exp Med. 2015; 8(7): 11645–11656. 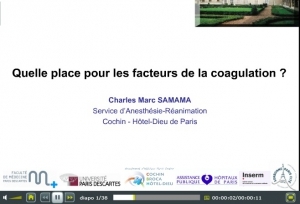 Quelle place pour les facteurs de la coagulation ? King DR et Al. J Spec Oper Med. 2012 Winter;12(4):33-8. La pose libérale d'un garrot est présentée comme étant un facteur essentiel de survie des blessés des membres. Encore faut il que ces derniers soient posés de manière correcte. Le document présenté laisse planer un gros doute. En effet il met en évidence qu'un garrot est mis en place 3 fois sur 4 alors qu'il n'y a pas de lésion vasculaire notable et que la plupart des garrots posés ne sont pas suffisamment serrés et sont en fait des garrots veineux. Pire seuls 1/3 des blessés ayant des lésions artérielles se voient appliquer un garrot artériel. C'est dire qu'une attention particulière doit être portée sur l'abolition du pouls artériel distal. Il s'agit là d'un enjeu pédagogique majeur. Battlefield tourniquet use can be lifesaving, but most reports are from hospitals with knowledge gaps remaining at the forward surgical team (FST). The quality of tourniquet applications in forward settings remain unknown. The purpose of this case series is to describe observations of tourniquet use at an FST in order to improve clinical performance. War casualties with tourniquet use presenting to an FST in Afghanistan in 2011 were observed. We identified appliers by training, device effectiveness, injury pattern, and clinical opportunities for improvement. Feedback was given to treating medics. Tourniquet applications (79) were performed by special operations combat medics (47, 59%), flight medics (17, 22%), combat medics (12, 15%), and general surgeons (3, 4%). Most tourniquets were Combat Application Tourniquets (71/79, 90%). With tourniquets in place upon arrival at the FST, most limbs (83%, 54/65) had palpable distal pulses present; 17% were pulseless (11/65). Of all tourniquets, the use was venous in 83% and arterial in 17%. In total, there were 14 arterial injuries, but only 5 had effective arterial tourniquets applied. Tourniquets are liberally applied to extremity injuries on the battlefield. 17% were arterial and 83% were venous tourniquets. When ongoing bleeding or distal pulses were appreciated, medics tightened tourniquets under surgeon supervision until distal pulses stopped. Medics were generally surprised at how tight a tourniquet must be to stop arterial flow–convert a venous tourniquet into an arterial tourniquet. Implications for sustainment training should be considered with regard to this life-saving skill. Le concept du garrot tactique est familier aux équipes militaires. L'expérience rapportée montre que ce concept doit également le devenir dans le monde de la médecine préhospitalière. 26 soit près de 10% blessés pris en charge ont fait l'objet d'une pose de garrot. Ainsi en cas d'attentat la pose précoce d'un garrot en cas d'hémorragie des membres est elle une mesure fondamentale de mise en condition de survie. We discuss the strengths of the medical response to the Boston Marathon bombings that led to the excellent outcomes. Potential shortcomings were recognized, and lessons learned will provide a foundation for further improvements applicable to all institutions. Multiple casualty incidents from natural or man-made incidents remain a constant global threat. Adequate preparation and the appropriate alignment of resources with immediate needs remain the key to optimal outcomes. A collaborative effort among Boston's trauma centers (2 level I adult, 3 combined level I adult/pediatric, 1 freestanding level I pediatric) examined the details and outcomes of the initial response. Each center entered its respective data into a central database (REDCap), and the data were analyzed to determine various prehospital and early in-hospital clinical and logistical parameters that collectively define the citywide medical response to the terrorist attack. A total of 281 people were injured, and 127 patients received care at the participating trauma centers on that day. There were 3 (1%) immediate fatalities at the scene and no in-hospital mortality. A majority of the patients admitted (66.6%) suffered lower extremity soft tissue and bony injuries, and 31 had evidence for exsanguinating hemorrhage, with field tourniquets in place in 26 patients. Of the 75 patients admitted, 54 underwent urgent surgical intervention and 12 (22%) underwent amputation of a lower extremity. Adequate preparation, rapid logistical response, short transport times, immediate access to operating rooms, methodical multidisciplinary care delivery, and good fortune contributed to excellent outcomes. Des plaquettes synthétiques pour arrêter le saignement ? Certains l'ont fait grâce à la technologie des nanoparticules (1, 2). Un espoir qui reste à confirmer. Explosions account for 79% of combat-related injuries, leading to multiorgan hemorrhage and uncontrolled bleeding. Uncontrolled bleeding is the leading cause of death in battlefield traumas as well as in civilian life. We need to stop the bleeding quickly to save lives, but, shockingly, there are no treatments to stop internal bleeding. A therapy that halts bleeding in a site-specific manner and is safe, stable at room temperature, and easily administered is critical for the advancement of trauma care. To address this need, we have developed hemostatic nanoparticles that are administered intravenously. When tested in a model of blast trauma with multiorgan hemorrhaging, i.v. administration of the hemostatic nanoparticles led to a significant improvement in survival over the short term (1 h postblast). No complications from this treatment were apparent out to 3 wk. This work demonstrates that these particles have the potential to save lives and fundamentally change trauma care. This review analyzes the new (2008-2013) hemostatic agents and dressings for enhanced efficacy in preclinical studies, and investigates supportive findings among case reports of effectiveness and safety in hospital and prehospital literature. A literature search was conducted using PubMed, National Library of Medicine using key words and phrases. The search revealed a total of 16 articles that fit the criteria established for third-generation hemostatic dressings. There were a total of 9 preclinical, 5 clinical, and 2 prehospital studies evaluated. Evaluation of these third- generation studies reveals that mucoadhesive (chitosan) dressings, particularly Celox Gauze and ChitoGauze, clearly show equal efficacy to Combat Gauze across many dependent variables. 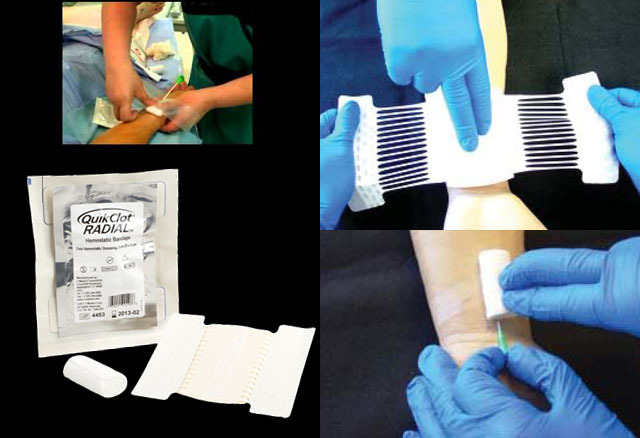 Chitosan-based products are ideal prehospital dressings because they are shown to work independently from the physiological clotting mechanisms. Many first-, second-, and third-generation chitosan-based dressings have been in use for years by the United States and other NATO militaries at the point of injury, and during tactical evacuation, in Operation Enduring Freedom and Operation Iraqi Freedom without reported complications or side effects. Based on the reported efficacy and long-term safety of chitosan-based products, increased use of Celox Gauze and ChitoGauze within the Department of Defense and civilian venues merits further consideration and open debate. Plaie de l'abdomen: Comprimez avec le genou ! Penetrating junctional trauma is a leading cause of preventable death on the battlefield. Similarly challenging in civilian settings, exsanguination from the vessels of the abdomen, pelvis, and groin can occur in moments. Therefore, iliac artery or abdominal aortic compression has been recommended. Based on prior research, 120 lbs (54 kg) or 140 lbs (63 kg) of compression may be required to occlude these vessels, respectively. Whether most rescuers can generate this amount of compression is unknown. To determine how many people in a convenience sample of 44 health care professionals can compress 120 lbs and 140 lbs. This study simulated aortic and iliac artery compression. Consent was obtained from 44 clinicians (27 female; 17 male) from two large urban hospitals in Edmonton, Alberta, Canada. Participants compressed the abdominal model, which consisted of a medical scale and a 250 ml bag of saline, covered by a folded hospital blanket and placed on the ground. In random order, participants compressed a force they believed maintainable for 20 minutes (“maintainable effort”) and then a maximum force they could maintain for two minutes (“maximum effort”). Compression was also performed with a knee. Descriptive statistics were used to evaluate the data. Compression was directly proportional to the clinician's body weight. Participants compressed a mean of 55% of their body weight with two hands at a maintainable effort, and 69% at a maximum effort. At maintainable manual effort, participants compressed a mean of 86 lbs (39 kg). Sixteen percent could compress over 120 lbs, but none over 140 lbs. At maximum effort, participants compressed a mean of 108 lbs (48 kg). Thirty-four percent could compress greater than 120 lbs and 11% could compress greater than 140 lbs. Using a single knee, participants compressed a mean weight of 80% of their body weight with no difference between maintainable and maximum effort. This work suggests that bimanual compression following penetrating junctional trauma is feasible. However, it is difficult, and is not likely achievable or sustainable by a majority of rescuers. Manual compression (used to temporize until device application and operative rescue) requires a large body mass. To maintain 140 lbs of compression (for example during a lengthy transport), participants needed to weigh 255 lbs (115 kg). Alternatively, they needed to weigh 203 lbs (92 kg) to be successful during brief periods. Knee compression may be preferable, especially for lower-weight rescuers.